Update 2017-Dec-4] TRichView setup now includes better version of this demo in <TRichViewDir>\ThirdParty\Export\SynPDF\Demos\RV2PDF\ folder. This better version reads all page properties from source RTF (or RVF) files and applies them to PDF, supports headers, footers, footnotes and endnotes, displays preview before exporting. thanks a lot for that demo! Very interesting. Unfortuantely, it doesn't seem to work when I try to convert an RTF that contains a table with both text and images in the cells to PDF. The text shows up, but the images are not there. can't compile the demo with Delphi 5. I know Delphi 5 is rather old but serves my purpose. I can not find where TPDFPapersize is declared. Any pointer to a missing uses entry is appreciated. Thank's Sergey for your fast reply. Unfortunately I was not clear in my question. The error is "undefined Height" which is in FPageInfo.PageSize.Height. So it says that it cant't find Height. For compatibility with older versions of Delphi, all occurrences of "PageSize.Height" must be changed to "PageSize.cy". I fixed the source code. again many thank's for quick support. At the end I figured the replacement with FPageInfo.PageSize.cy out myself but thank you anyway. The hole demo works now like expected, thank you. 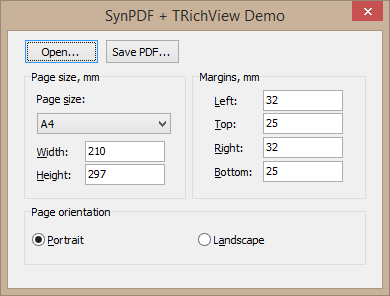 TRichView setup now includes better version of this demo in <TRichViewDir>\ThirdParty\Export\LLPDFLib\Demos\RV2PDF\ folder. This better version reads all page properties from source RTF (or RVF) files and applies them to PDF, supports headers, footers, footnotes and endnotes, displays preview before exporting.